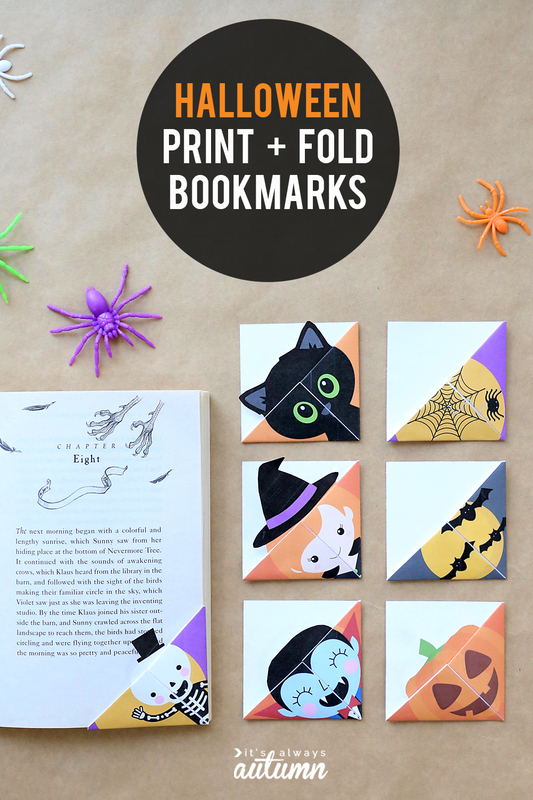 In today’s post: Get the templates for 7 different print + fold Halloween bookmarks. 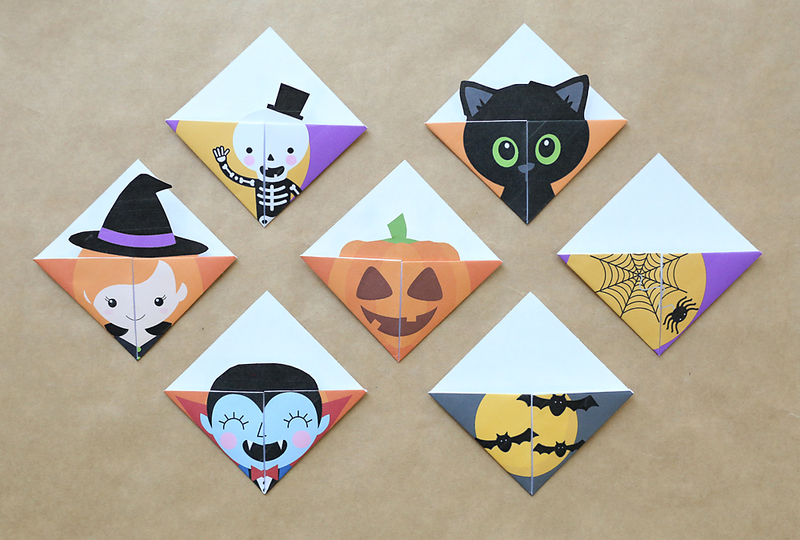 This is an easy and inexpensive Halloween craft you can do at a school party or with your own kids at home. Does anyone else dread getting that email from your child’s teacher saying they need someone to run a “station” at the class Halloween party? I mean, I’m totally willing to help out in a class party, but coming up with a craft a whole classroom of kids can do in 15 minutes that costs virtually nothing is not my idea of a good time. 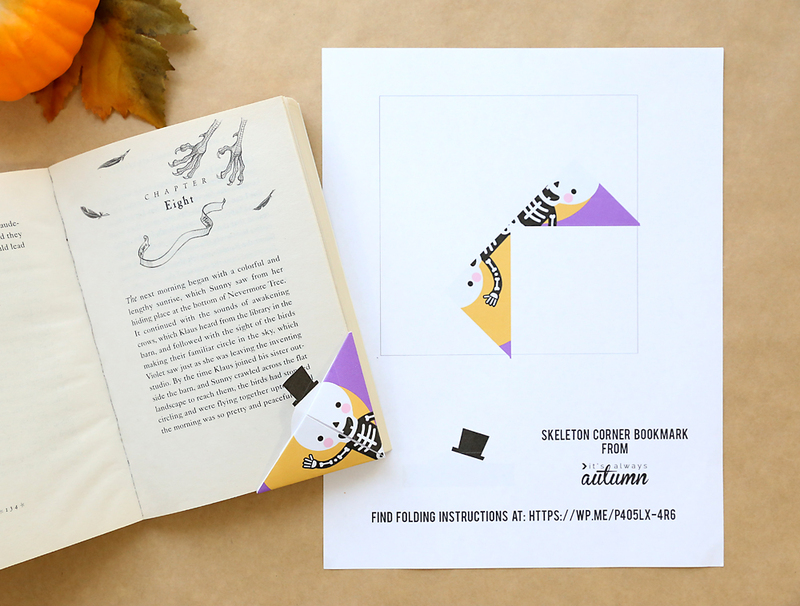 But last year I started making print + fold bookmark templates, and they’ve been a hit with my grade school age kids. So I think they’d make a great easy craft for a class party! 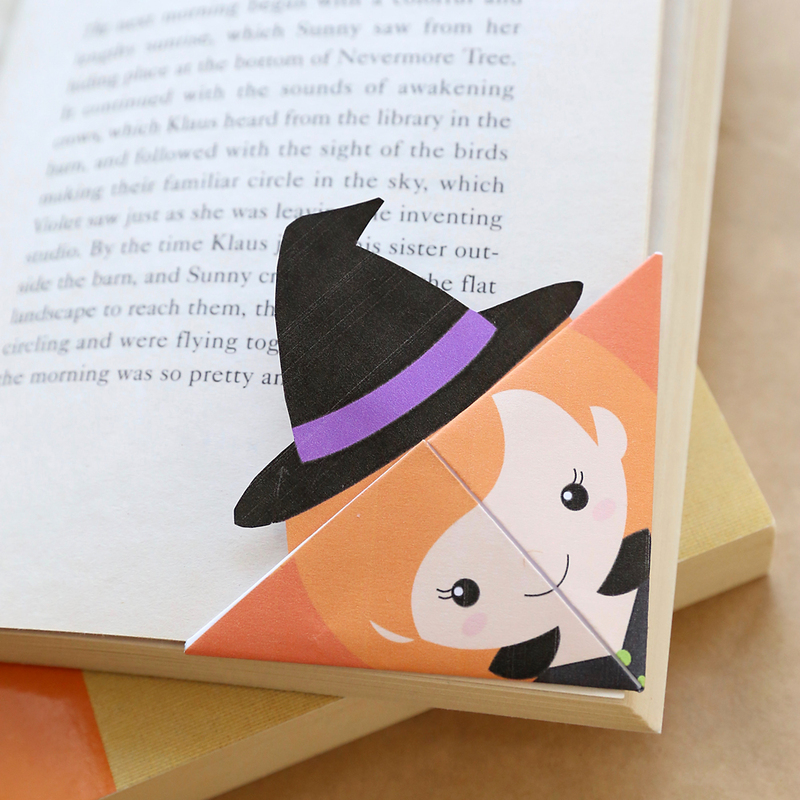 Today I’m sharing printable templates for seven different Halloween bookmarks. 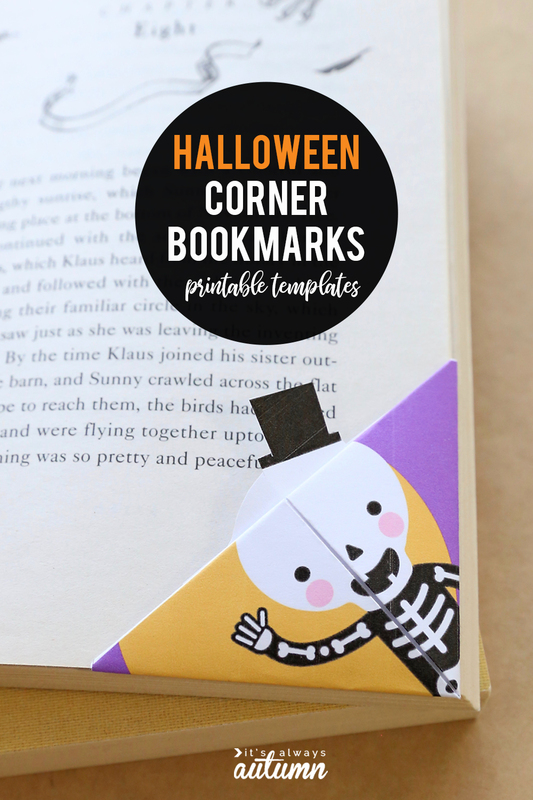 You can print the templates and then cut and fold them into cute little bookmarks that slide onto the corner of the page you’re on to save your place. Or a skeleton, cat, spider, or bat. 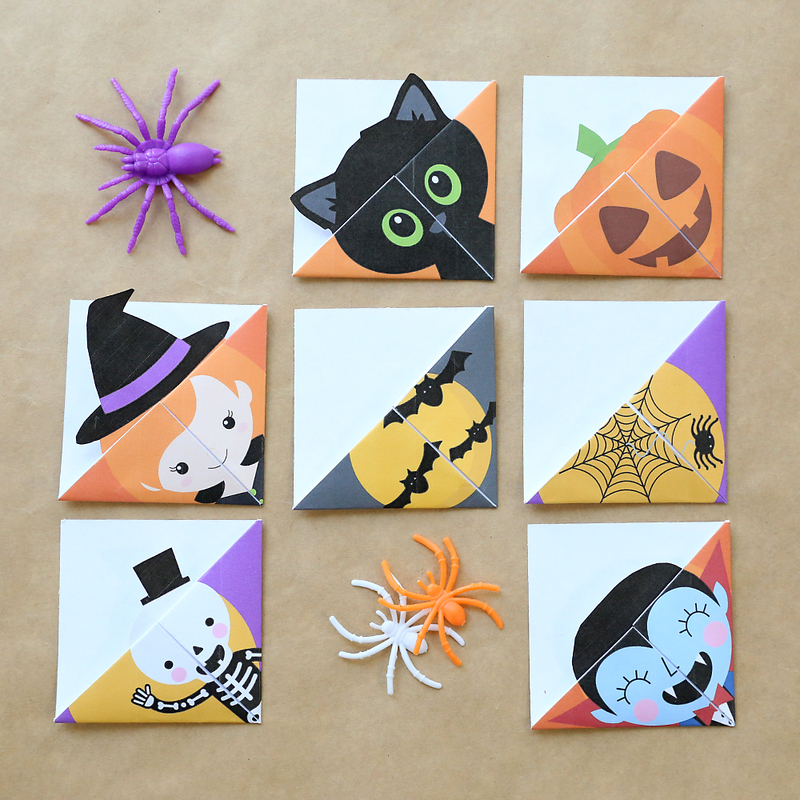 For a great classroom activity for younger grades, check out my print + color Halloween masks. This is what the printed templates look like. Be sure to print them out at 100% and use plain paper, not cardstock (cardstock is too thick to fold easily). 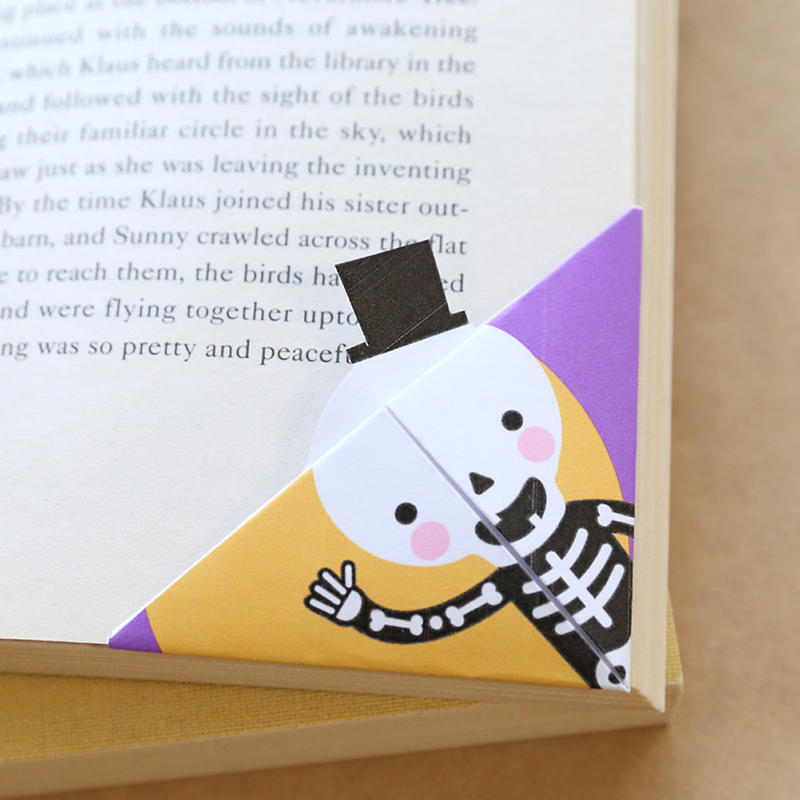 To make a Halloween bookmark, you’ll just download and print out your favorite design, then cut out the square and the additional hat piece (if there is one). You can use a paper trimmer to get the cuts exact, or use scissors and just cut carefully. 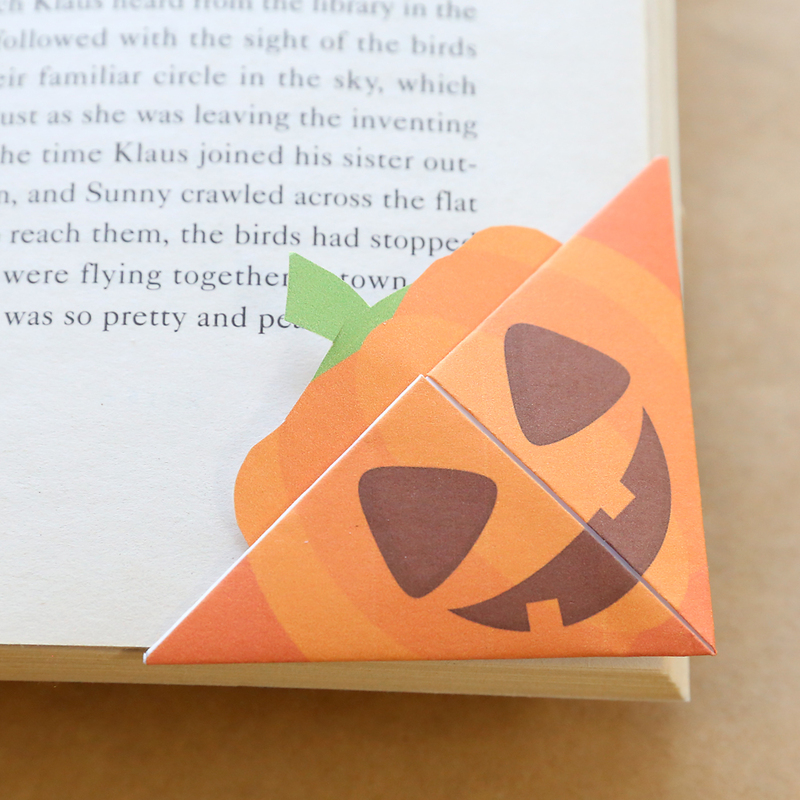 A few folds later you’ll have an origami bookmark that you slides onto the corner of a page to keep your place. Keep scrolling down for the downloads, a video demonstration, and detailed folding instructions. And here are the written instructions. 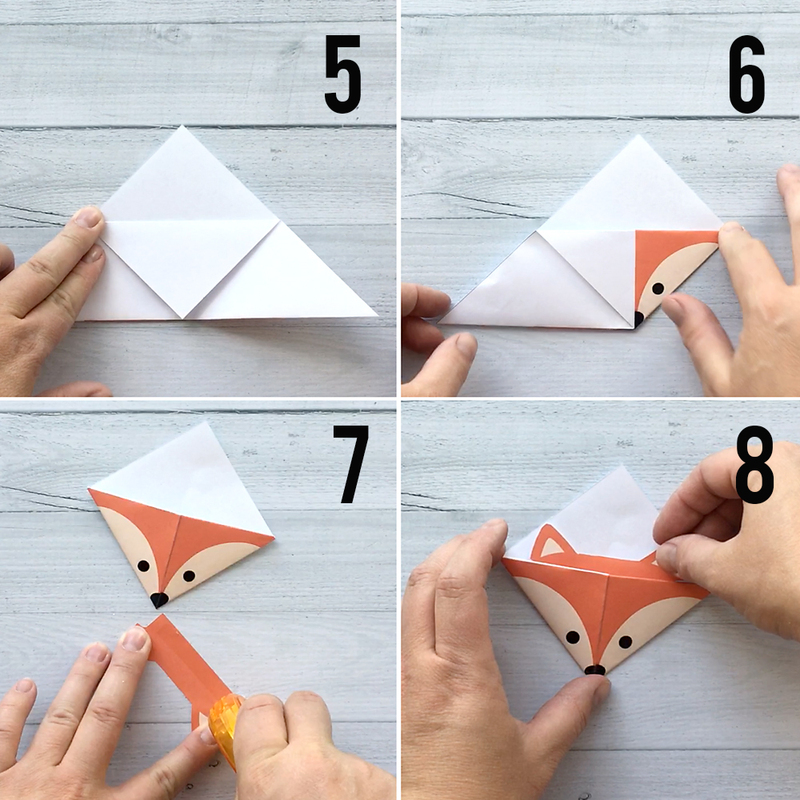 Please note that the photos below use an example from my Woodland Animals Origami Bookmarks. But don’t worry, the folding instructions are exactly the same. 1 – Print bookmark template on plain white printer paper. Trim along lines to cut out the square. 2 – Fold square in half diagonally to create a triangle. Both colored areas should show on the top of the triangle. 3 – Flip the triangle over. 4 – Fold each outer corner of the triangle to meet together at the top of the triangle and form a face. When doing this, make sure the two sides of the face line up. Press along all the folds to crease. 5 – Open up the last fold you did so you are back to the original triangle. Fold the top point of the triangle down, using only the *top* layer of paper. 6 – Fold one corner back up and tuck it into the “pocket” created in the last step. Repeat with the other corner. 7 – Cut out the ears and add adhesive along the straight edge. 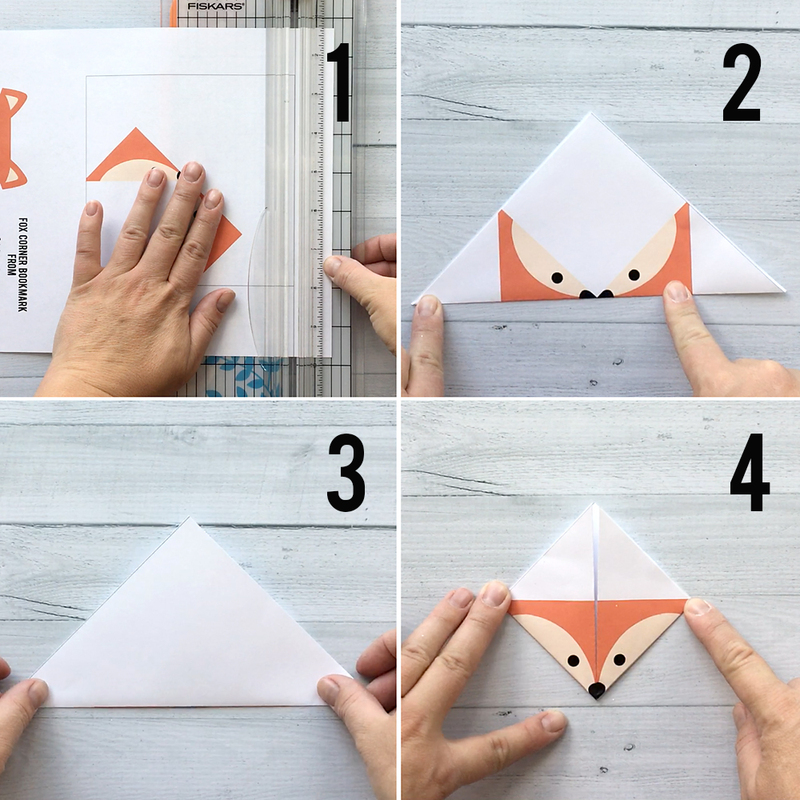 8 – Tuck the ears inside the pocket to complete the bookmark. 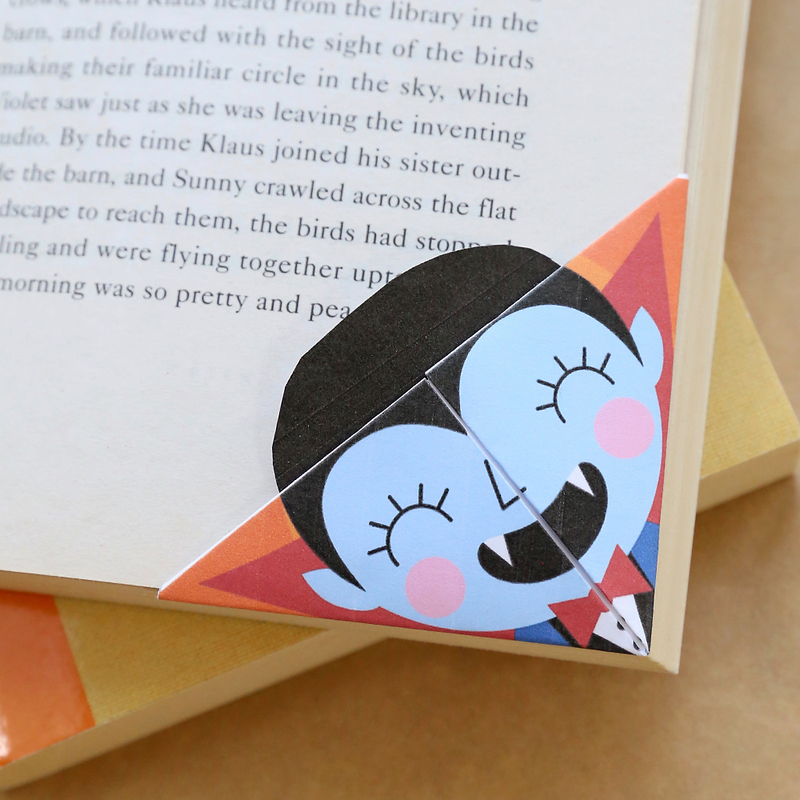 These bookmarks go on the bottom corner of the page so the characters are not upside down, but don’t worry – they stay in the book quite well! We have had no problems with them falling out. For more bookmark designs, find the woodland animal bookmarks here and the Christmas bookmarks here.